Arizona National Golf Club is Southern Arizona desert golf at its finest. Designed by Robert Trent Jones, Jr. in 1995, the golf course, located in Tucson, Arizona, is nestled in the foothills of the beautiful Santa Catalina Mountains adjacent to the Coronado National Forest. The golf course follows the rugged natural flow of the land across shady mesquite-lined arroyos and skirts craggy rock outcroppings. Along the way, Arizona National Golf Club�s diverse 6,785 yard layout will throw enough decisions and classic golf-in-the-desert challenges at you to test the very limits of your ability. Yet, it has the flexibility to do so without ever becoming unfair. To compensate for the challenge, you will enjoy some of the most spectacular scenery of any golf course in Southern Arizona, including panoramic mountain vistas, forests of giant saguaros and the rare beauty of nine natural springs. Description: 18-hole championship golf course designed by Lee Trevino featuring beautifully designed holes with mountain and desert vistas. Crooked Tree hosts the Tucson Tour Players Qualifying, co-hosts the Southern Arizona Open with Tucson National, and hosts the Pima County Amateur. Facility includes practice putting greens, chipping green, driving range plus a full service restaurant with banquet facilities. del Lago Golf Club is Tucson�s newest and brightest star. Opened in late 2000, the golf course is quickly gaining a prominent position among the better-known courses in the area. A little different from many desert courses, del Lago plays like more of a combination of links and desert golf, featuring wide sweeping fairways that drift off into the surrounding valleys and arroyos, and lead you to oversized greens that often require a traditional bump and run shot. Each nine offers either one of the many lakes that dot the course, or threads through well-placed bunkers that are waiting to catch the slightest mistake in approach shots. The golf course will require every club in the golfer`s bag and a good supply of nerves on slick, undulating greens. Perceived to be far out of town, del Lago is really not, even though those who know about it would just as soon not tell you that. A short drive east from Tucson on I-10 to the Vail Road exit and you�re playing golf in just a few minutes. Future plans call for an elegant clubhouse and some exclusive home sites on the hills looking over the golf course. The time to play del Lago is now, for very soon you may have to wait in line as the popularity of this magnificent golf course grows. The Randolph Golf Complex is comprised of two 18-hole championship golf courses, Randolph North and Dell Urich. Both courses are perhaps two of the favorites among the locals for their accessibility and general proximity to the center of Tucson, as well as for the fact that they probably grew up playing at Randolph, which is now celebrating its 75th birthday. Once the site of the Seiko Match Play and the PGA Tucson Open, and the current site of the Welch�s/Circle K LPGA Championship, Both Randolph and Dell Urich are pure parkland tree-lined courses with relatively flat fairways and big undulating greens. 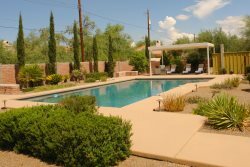 They are easy to walk and provide time to take in some of the views of the city and mountains that surround Tucson. El Rio dates back to the 1930�s and was the original site for the PGA Tucson Open. The course layout features tight fairways and small greens�rather postage stamps that test your short game and touch. Ideal for the short hitter or a good warm-up round, El Rio measures only 6,400 yards from the back tees. Located on Tucson�s near west side, El Rio offers a lot of character, charm and great golf for a great price. Enke is the desert-style course in the city system and is considered by many to also be the most challenging. The hilly terrain and the undisturbed surrounding desert can test the best players and shots. Strategic bunkering forces you to go for large greens with many tiers that can put you in three putt range following any miscalculation on your approach. If the golfer is looking for true desert golf, Enke provides the best value in town, a hidden jewel not just reserved for the local players who consider it their own. Location: 8251 E. Irvington Rd. While many courses boast of a signature hole or two, Heritage Highlands presents golfers with one breathtaking view after another. Nestled at the base of the Tortolita Mountains, many tees feature sweeping views of the Tucson cityscape and surrounding five mountain ranges. Six sets of tees welcome golfers of all experience and skill levels to enjoy a course selected by Golf Digest readers as a four-star winner on the 2000-2001 �Places to Play� list. While not the brutal �target golf� so often found in the Arizona Desert, Heritage Highlands is still laden with risk/reward opportunities, featuring extensive mounding, strategically placed bunkers, and green side lakes. Heritage Highlands. An exceptional golf experience, which you must play! The Hilton Tucson El Conquistador Golf & Tennis Resort is a Mobil Three-Star and AAA Four-Diamond, full destination golf resort nestled in the foothills of the Santa Catalina Mountains on 500 acres of high Sonoran Desert. With 45 holes of spectacular golf, it is the largest golf resort in Southern Arizona. Two championship 18-hole layouts are situated at the Golf Club, while a superb 9-hole track plays around the resort further up the mountainside. On the resort lies a rare find�one extraordinary facility with two sought after golf challenges. Golf Nirvana. Traditional play on the Catalina Course, a park-like setting and home to the PGA Tour for over three decades and the breathtaking Sonoran Course, designed by Ryder Cup captain Tom Lehman. Are you looking for a golf experience like no other? Does the unusual yet beautiful excite you? If you answered yes to either of these questions, then you are ready for The Pines Golf Club. In the Town of Marana, Northwest of Tucson, Arizona The Pines represents an evolution in golf course design and the enjoyment of the game. In 2000, following a decision to abandon the sand and gravel quarry adjacent to the original golf course, the Town of Marana and the quarry/golf course owner agreed on a plan that would reclaim the quarry. By relocating 10 golf holes into the old quarry and reconfiguring 8 of the existing holes one of Tucson`s most popular golf courses was transformed. Today the unique desert landscape is highlighted by dramatic elevation changes and the addition of thousands of trees. Location: 8480 N. Continental Links Dr. Designed by architect William P. Bell in 1933, this 18-hole championship golf course stretches 6,863 yards with a U.S.G.A. rating of 72.50 and a slope rating of 128. Silverbell is built along the west bank of the Santa Cruz River and features nine lakes waiting to capture any errant shots over them. At 6,800 yards from the championship tees the long hitters can take advantage of the ample fairways and generous greens. But be careful, the trees are very mature and loom over much of the golf course and the greens are tricky to read. Starr Pass Country Club & Spa is semi-private and offers golf to both members and the general public. Meandering through the Tucson Mountains, the three nines at Starr Pass (Rattler, Roadrunner & Coyote) offer five sets of tee boxes providing a fair test for golfers of all abilities. From a challenging venue at over 7,000 yards, to a more forgiving course at 5,213 yards, Starr Pass offers unbelievable views of the Tucson Valley, and utilizes its natural terrain to provide a spectacular setting. The Golf Club at Vistoso has been ranked as the top public course in Tucson by Golf Digest for good reason�.it is one outstanding layout! It�s easy to understand why designer Tom Weiskopf liked this property so much. As is his custom, Weiskopf used the natural terrain, without upsetting the flow of the land, and routed the course in harmony with its surroundings. This balance of vegetation and desert surroundings give the golfer a feeling that each hole blends into the landscape in a natural, complimentary style. Vistoso means �colorful views� and there is plenty of scenery, from the surrounding desert flora and fauna to the Catalina and Tortolita mountains in the background. Many favorite holes are perfectly framed by these mountain views from the tee to the green, where missed putts typically flow to the Tucson valley floor off in the distance. Golfers are not asked to drive over endless desert wastes, but can be lulled by the generous fairways that demand accuracy and iron selection for every approach. The greens are well bunkered but are easy to read and extremely fair. The condition of the golf course, particularly the greens, is considered to be one of the best in Tucson. After the round, and perhaps a bit of shopping in the well stocked pro-shop, the patio of The Golf Club at Vistoso offers a perfect perch to watch the late afternoon glow on the nearby mountains and enjoy some terrific clubhouse cuisine. The friendly and knowledgeable staff can provide you with everything from lessons, to golf clubs to assistance with a corporate outing. Located in Oro Valley, just north of Tucson, Vistoso is an easy drive from just about anywhere. Adjacent to the golf course are casitas available for those who want to play this gem over and over again. The Golf Club at Vistoso is a must see for any golfer coming to Arizona. Winding through the canyons and arroyos of this fabulous 600-acre high Sonoran Desert preserve are the two spectacular Tom Fazio-designed championship golf courses that are on every list of the nation`s very best. The golf experience at Ventana Canyon offers a unique blend of challenge and playability. Both the Mountain and the Canyon courses meander from one unique hole to another. Four sets of tees allow each player to test his or her ability on a well marked and manicured course. A spacious practice facility, an award winning Pro Shop with an attractive line of clothing, equipment and merchandise, and a player service staff to meet your every need all come together to round out a truly memorable day and an unforgettable round.